Making my own jewelry makes me feel nostalgic for summer days spent braiding colorful yarn into friendship bracelets. 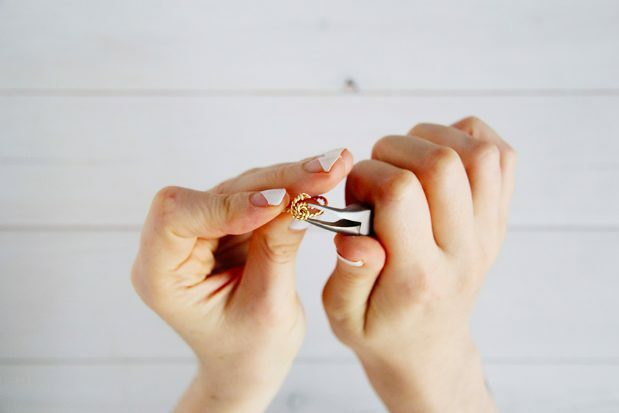 These DIY jewelry ideas are major upgrades from the summer camp versions of your youth, though. Think quartz bangles and dainty knot rings. You’ll be confident leaving the house with any of these DIY pieces on. 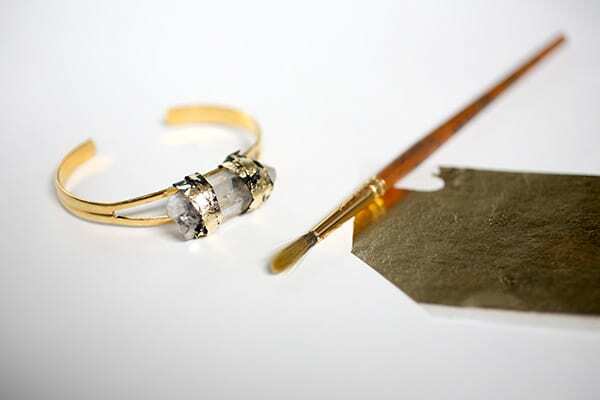 Making custom jewelry with your own hands is truly satisfying and, honestly, pretty relaxing. It’s like a focused meditation with an awesome reward at the end. 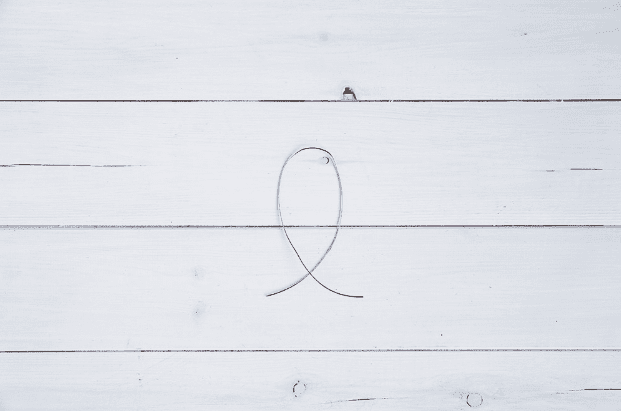 Kind of like doodling your way to mindfulness. Being creative is great therapy! 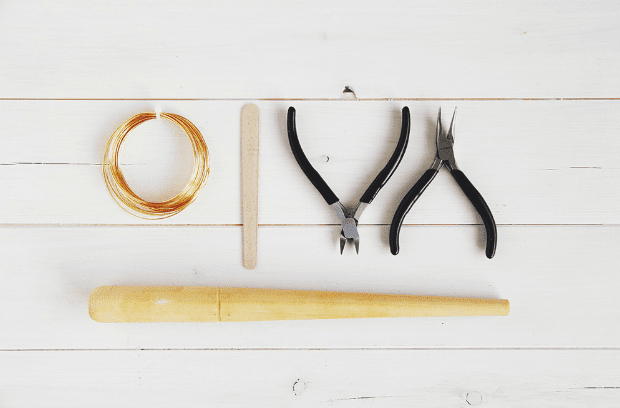 Another major upside to DIY jewelry is the money you can save. Instead of buying another pair of earrings everyone else can buy, why not make your own unique version? Roll up your sleeves and make some new bling without draining your bank account. 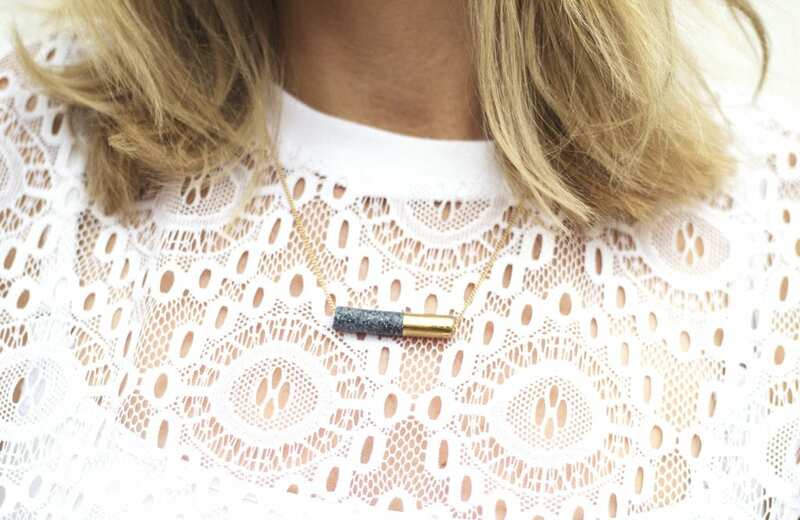 Here are 5 completely awesome DIY jewelry projects to tackle this summer. Don’t be afraid to get a little messy! 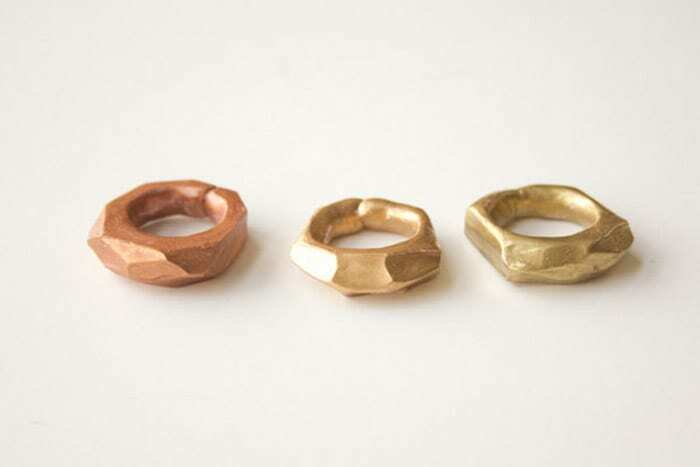 These beautiful rings look a) a lot more expensive than they actually are and b) like a metalsmith carved them out of gold. 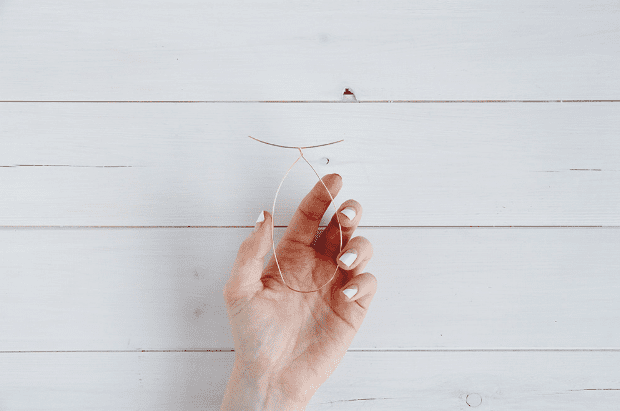 This DIY jewelry idea is one that all of your friends will want to copy once they realize how easy and cheap they are to make. 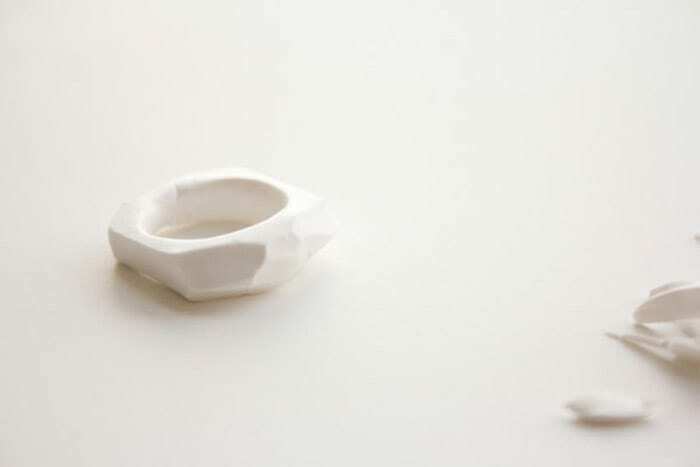 Believe it or not, these faceted rings are formed out of clay and take about 30 minutes to make if you don’t count the drying time. 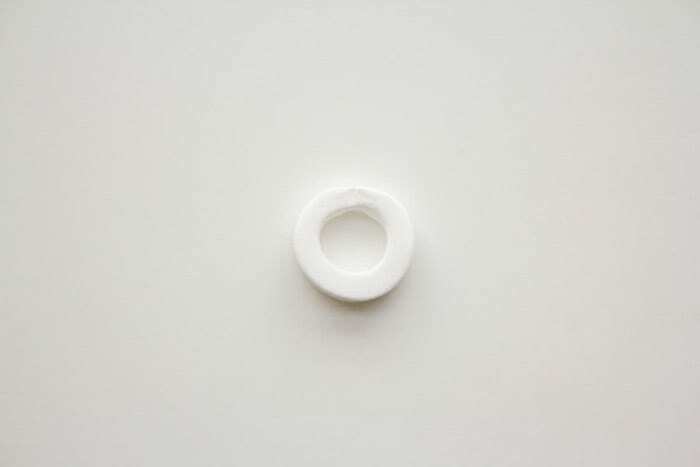 They’ll quickly become part of your everyday ring game. 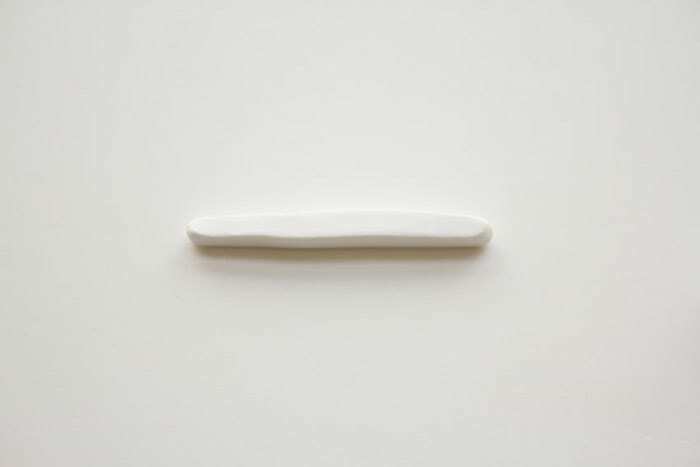 Start by molding a small amount of clay into a strip that’s flat on all sides. Make sure the strip is long enough to wrap around your ring finger. Bend the strip into a circle and gently press the ends together. Take your knife and start carving away. First, carve off the excess near the backside of the ring where the ends meet, and around the sides (where it will be between your fingers). 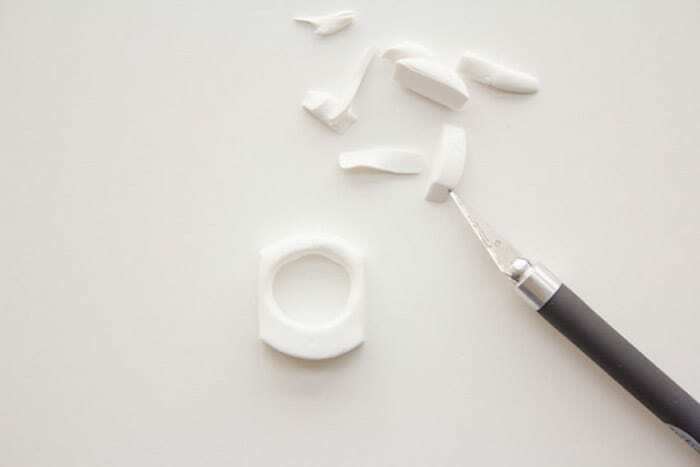 This step will take away some of the bulk of the clay so that the rings fit neatly on your fingers. Then, on the front side of the ring where the majority of the clay remains, start to carve facets and angles at random. 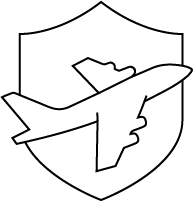 There’s no right or wrong way! 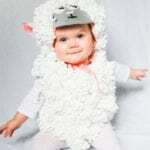 You may have to experiment a bit to get the look that you like. Make a few! Bake your ring according to the directions on the clay package. 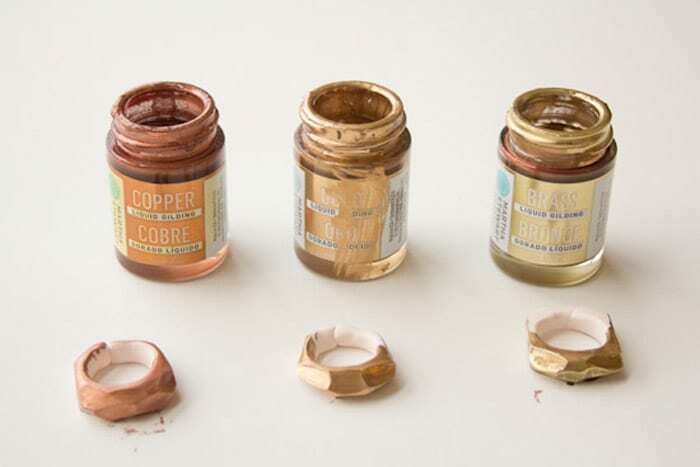 After they’ve cooled, paint your rings with the liquid gilding. I found that they dry well suspended on bamboo skewers. Make sure that they’re dry, then stack ’em up and wear ’em out! And don’t be afraid to experiment with other shapes, sizes and colors. Have fun! 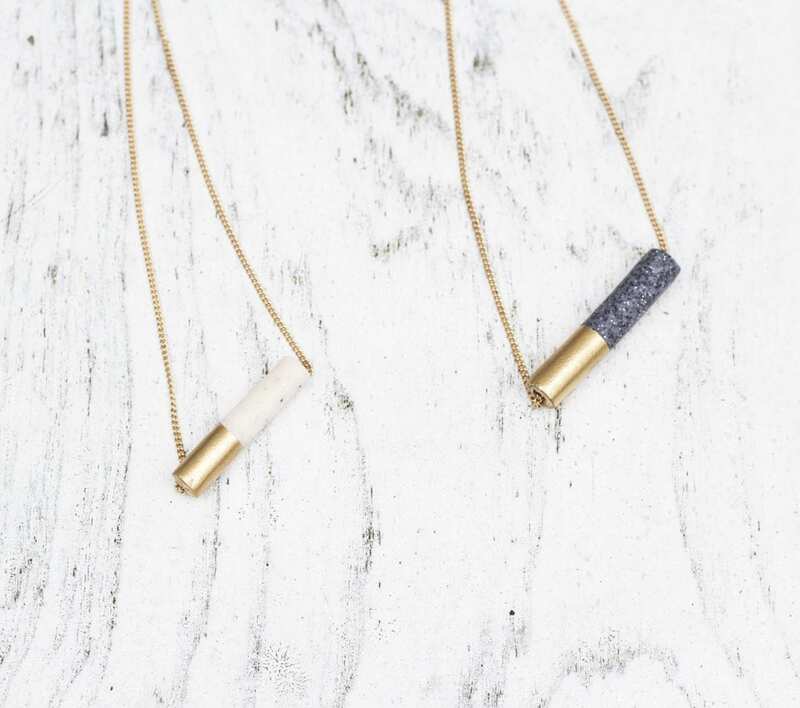 These dainty necklaces are perfect for layering. You might want to make more than one in a few different colors! 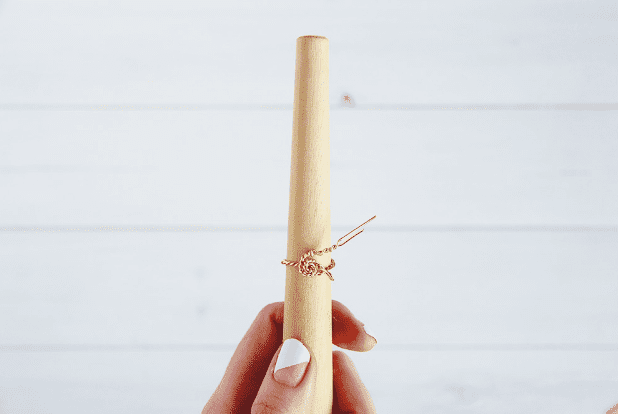 This DIY jewelry idea is an awesome piece to make as a gift for someone when you’re low on money or just not sure what to give them. 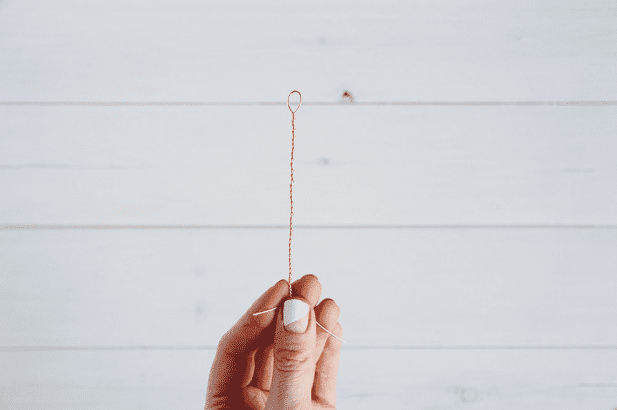 A simple but beautiful necklace that can be worn everyday is a special piece your family and friends will cherish … and actually wear out of the house. 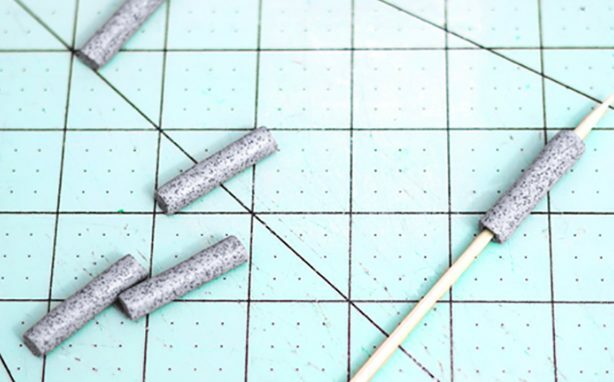 Preheat the oven to 110 C. Then cut a chunk of the Fimo and roll and handle to soften in your hands. Then roll on the cutting mat into a long sausage shape. Keep on rolling to make an even cylinder about 1/4 inch in diameter. Cut the long sausage into sections about 1 1/2 inches long. Then gently push the skewer into the cylinder until it goes the whole way through. 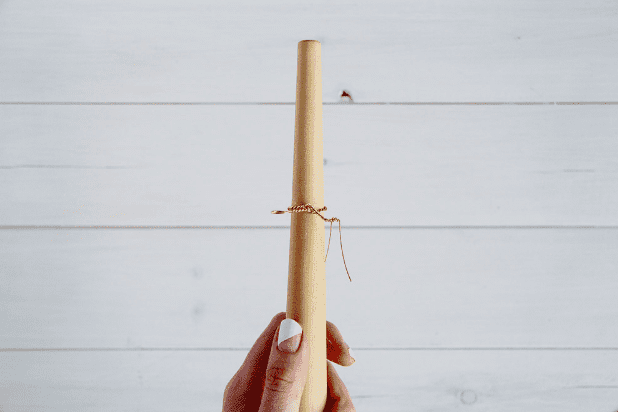 Give it a wiggle to make the hole a little bigger and take the skewer out. Place on a lined baking tray and bake in the oven for 25 minutes. Leave to cool completely. Then tape a section of each bead so that no gold color can reach that area. Then spray the exposed area with the metallic spray paint. I did this on the skewer and left it to dry in this way too so as not to scuff any of the paint.Once dry you can now thread the bead onto your chain and wear! 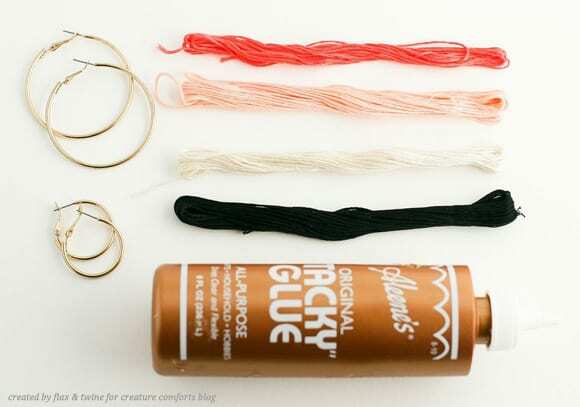 Here’s a grown-up way to get back to colorful thread DIY jewelry. 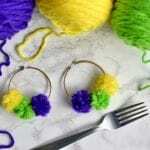 Instead of using thread to weave a basic friendship bracelet, why not wrap it around hoop earrings for a unique piece of jewelry instead? 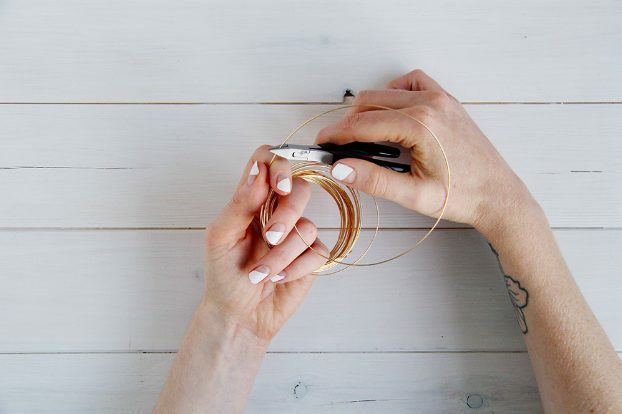 This DIY jewelry project is super-quick, easy and cheap to make. It’s a fun DIY to do with friends since you can wrap and drink at the same time! Cut 40 inches of your chosen embroidery thread colors for a largehoop, less for smaller hoops. If you place the hoops in your ear before you start, it will help you decide where to change colors and place the majority of your design color work (remove hoop from ear before next step). 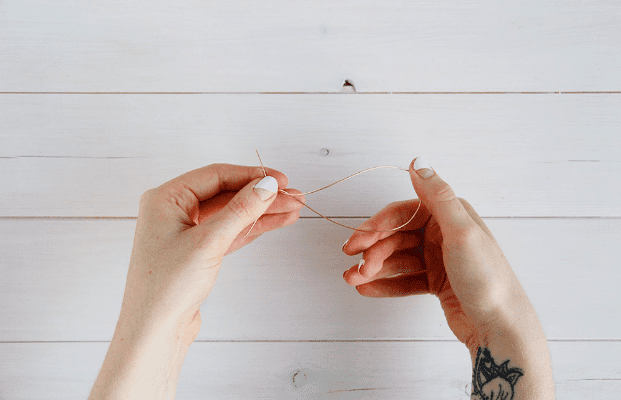 Take desired embroidery thread colors and line them up parallel to the hoop, placing the end of the thread in the bit of glue. 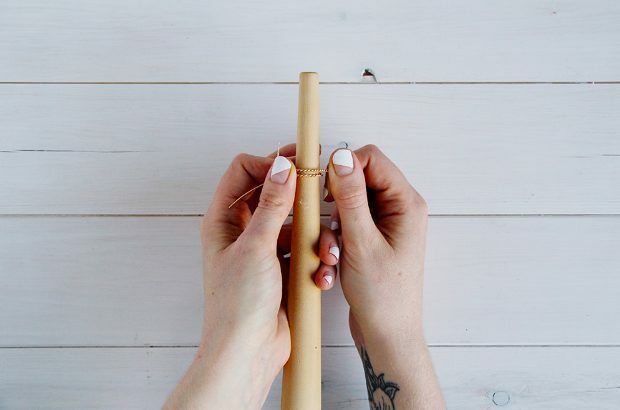 Choose the thread color you want to start with and begin wrapping it around the hoop … the other colors you aren’t using can go along for the ride (make sure they are being hidden by the thread color that you want to have showing). 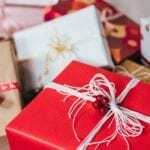 Keep wrapped thread snugly side-by-side so you can’t see the hoop or other colors underneath. When you get to the end, place another small bit of glue. 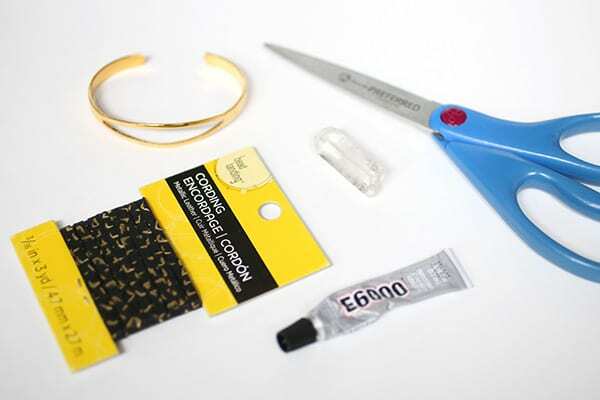 Wrap thread directly over that glue, using your finger to wipe away any excess. Trim the embroidery thread colors that you are not using first as close to the hoop as possible. Then place a little extra glue to secure the remaining thread over the ends of the other colors, and trim excess. Repeat the finishing process on the other side of thewrapped hoop. 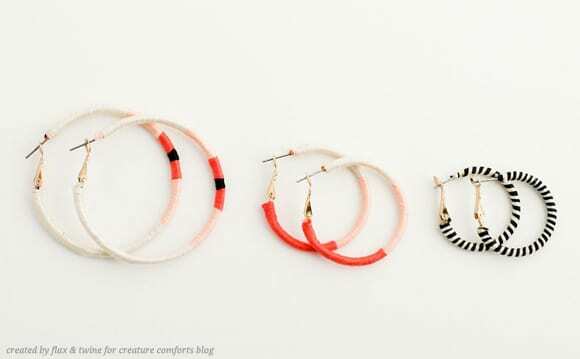 Repeat full process for your other earring. Voila! 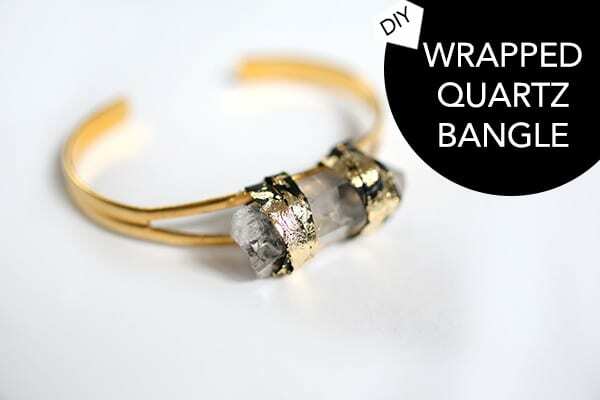 This beautiful quartz bangle is a DIY jewelry project that’s inspired by the Vega Crystal Flame Cuff sold at Free People. 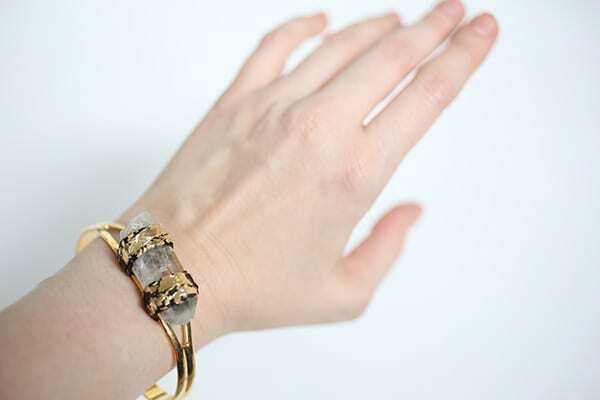 Crystal and gold jewelry can be really expensive. 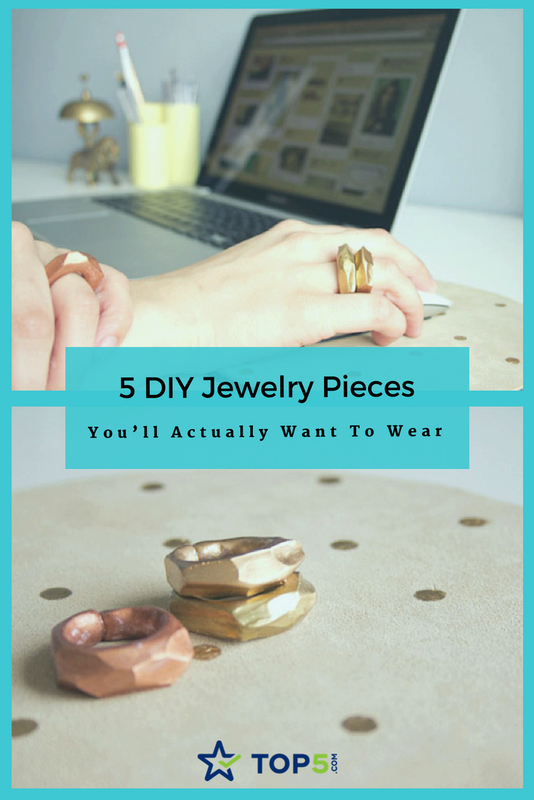 Save yourself the money with this awesome jewelry DIY instead. When picking out your center crystal, look for raw, imperfect pieces. Rough cut gemstones are often cheaper and give a cool organic feel to your jewelry. Figure out the placement of your crystal. I liked the crack in the middle, and with the space in the bangle, you should be able to partially “seat” your crystal in the bangle. 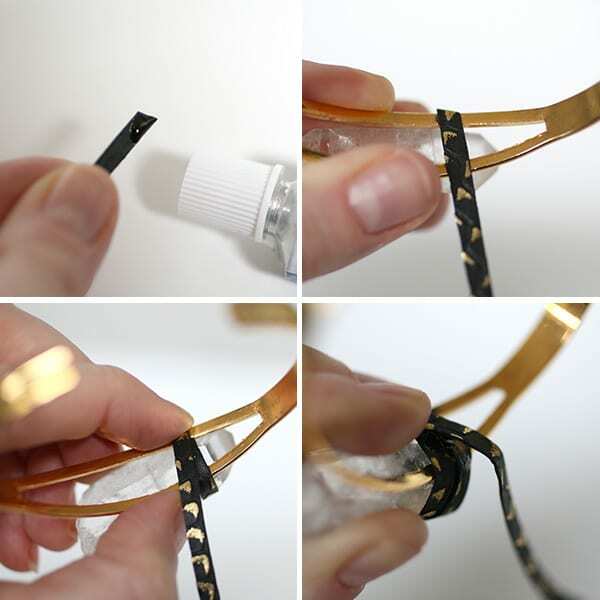 Squeeze a small amount of glue onto the end of the suede lacing cord. 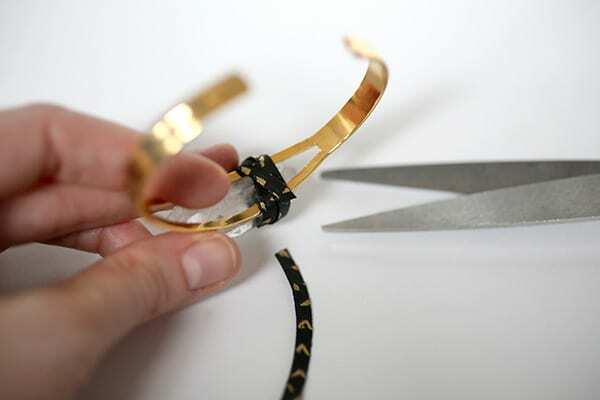 Start by placing the lace into the underside of the bangle, allowing the glue to set for a minute. 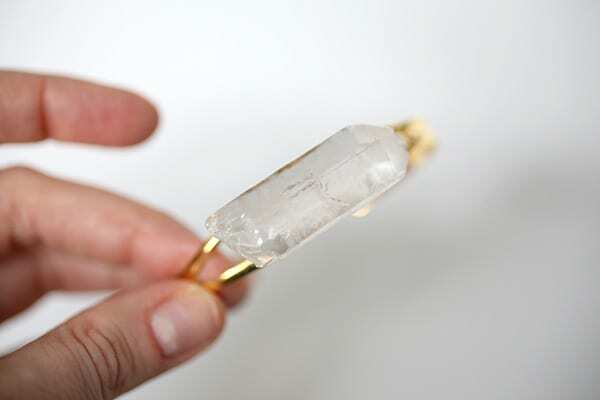 Hold the end down and wrap around the crystal tightly. Repeat a couple times (I found I liked 3 times around the crystal), then put a dab of glue on the underside of the cord again. Press the cord down until set. Repeat for the other side of the crystal. Optional: For a more luxe look, use a metal leafing kit (glue + leafing) to adhere some gold to the top of the lacing, brushing off the excess with a soft brush. 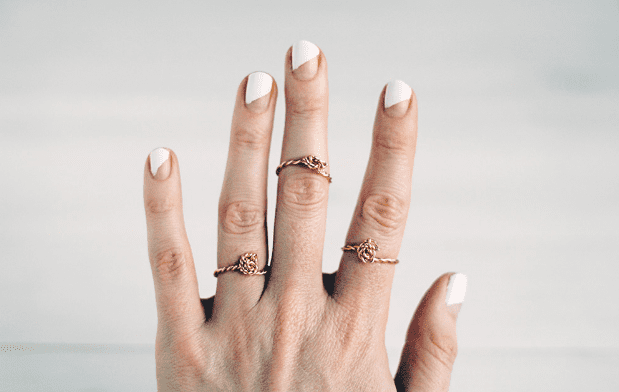 If you’re someone who prefers dainty jewelry, this is the perfect DIY for you. 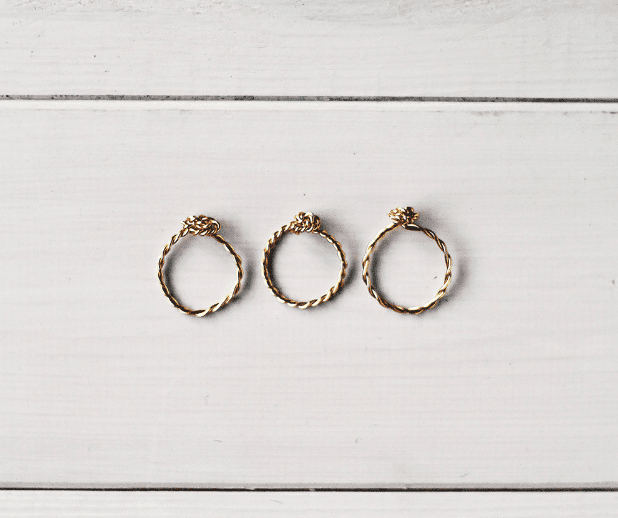 These simple, dainty twisted knot rings are cuteon their own or layered with other pieces. This DIY jewelry is also a great adult version of the BFF heart necklace, so make one for your BFF and one for you. 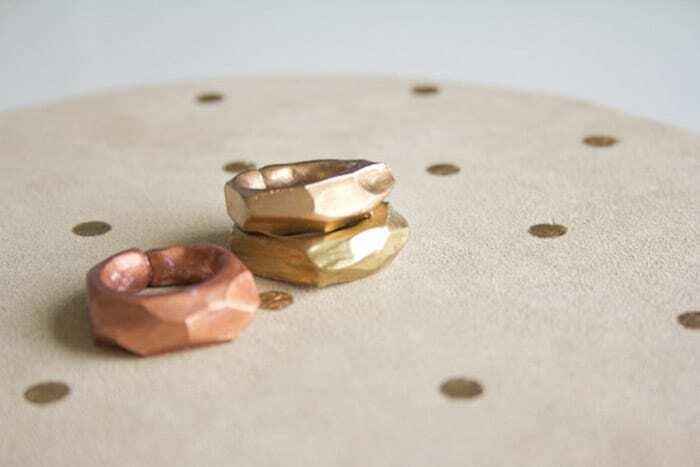 The great thing about DIY rings is you never have to worry about finding the right size, since the fit is custom! Cut a length of wire 30 cm/15 in. and roughly fold in half into a fish shape. Twist the “tail” and bend the wire ends outwards. Begin to twist the body of the fish whilst holding the tail. Continue to twist until until you have a long wire with a little bobble at the end. Wrap the wire around the ring mandrel so the ends cross. Start to twist the ends around each other to create a spiral knot. Cut off the excess wire. 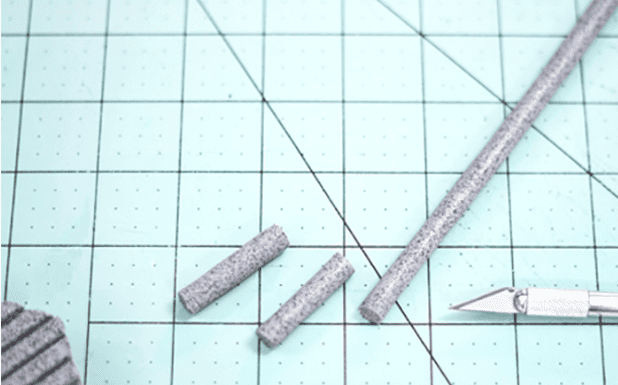 File the ends of the wire with a nail file and squeeze them close to the rest of the knot with chain-nose pliers. 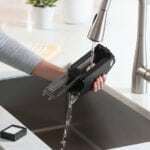 Looking for more fun DIYs? 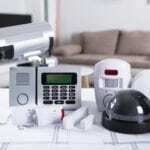 Try these 10 easy and affordable backyard DIY projects. 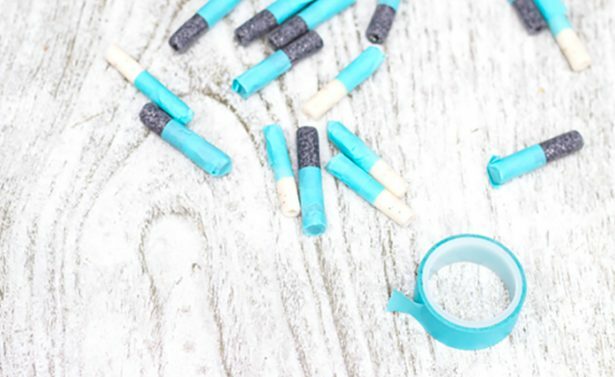 25 Crazy Easy DIY Earrings You Can Make In The Next 10 Minutes!